This remarkable postcard shows Shankardas Swamigal's Tamil drama group on a visit to Ceylon [Sri Lanka] in 1890, although the postcard is from about 15 years later. The revival of Tamil theatre was a major development and helped lead to the rise of such characters as the great singer Balamoni. Veejay Sai in his recent (and highly recommended) book Drama Queens (2017, p. 25) writes that "the arrival of the British introduced the proscenium form [where a clear framed stage separates the action from the audience] of theatre. Shankarda Swamigal [1867-1922] became the link between these earlier performance traditions and twentieth-century Tamil theatre. Exploring the possibilities of professionalizing theatre, he devised the earliest formats of presentation. By retaining the song, dance and comic elements and the Puranic stores of earlier practices, he adapted them to the proscenium stage. He travelled with the troupe across the region. 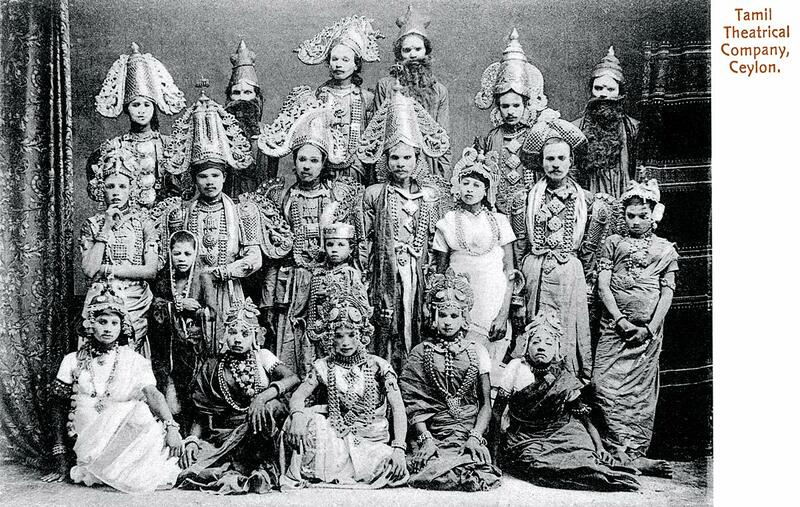 Theatre groups organized themselves into sangams, or gatherings, that dealt with everything, from logistics to payments."